Sizzling Black Pearl Satin Silk Boxers. Look once. NO. Look twice. These solid color satin silk boxers easily qualify as the ne plus ultra of men’s solid color silk boxers. In other words, the most perfect example of very high quality silk boxers accompanied by exquisite silky feel, stroke, touch, and softness — the kind to die for. The pearly colors of our satin silk will glow, gleam, and glimmer with a richness, class and elegance that’s simply unmatchable. Our silk boxer shorts are styled in luxurious, luminous 80-gm Satin Silk Charmeuse that is as lush, soft, and creamy as any silk you’ll find at a high-end store anywhere in this world, but at a fraction of the price. Waist sizes: S (30-32”), M (33-34”), L (35-36”), XL (37-38”), 2XL (39-40”), and 3XL (41-42”). Our sizes are generous and lengths are 16.5"-17.75" for sizes S-3XL. The inseams are about 5.5" for all sizes. Three-panel construction. Authentic 100% Silk. Imported. Hand wash or dry clean. Easy wash and iron instructions included. 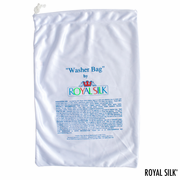 To machine wash, we recommend our unique made-in-USA Washer Bag for silks, purchased separately, and available in two sizes. Order your pair today.